An aromatic, hearty soup for a cold spring day. 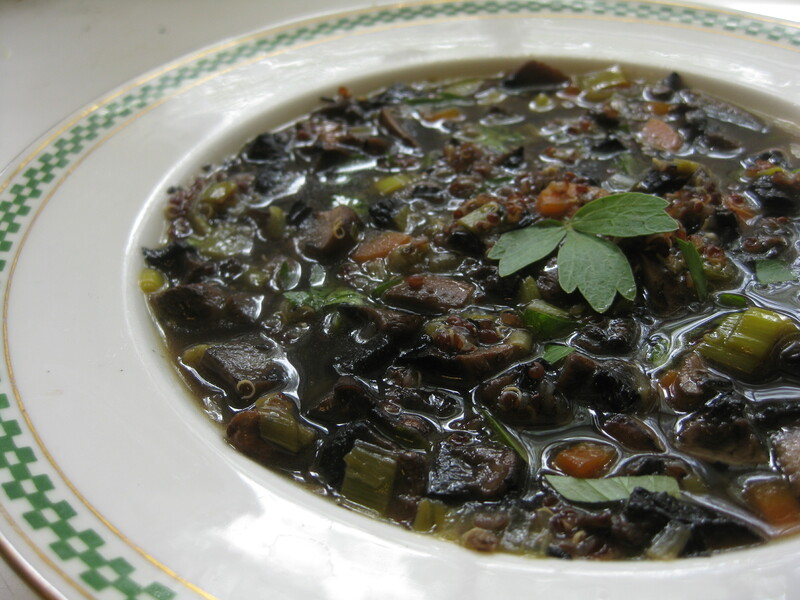 A gluten-free version of mushroom barley soup, made with carrots and leeks and garnished with flavorful lovage. I used homemade beef stock but chicken stock or vegetable or mushroom broth would work also. This was a delicious antidote for the snappish weather during a break from preparing the gardens for spring planting. Clean the mushrooms and chop them into small pieces, about 1/3-inch. Working in batches, heat about a teaspoon of butter or oil in a wide pan over medium-high heat. Add enough mushrooms to cover the bottom of the pan without overcrowding and let them cook undisturbed for a few minutes until they exude their juices. Stir and cook until tender. Remove them to a bowl, wipe out the pan and repeat with the remaining mushrooms. Heat another teaspoon or two of butter in a soup pot and stir in the leeks and carrots, stirring to coat with the oil. Cook until the leek is just transparent. Add the mushrooms and stock or broth and cook at a simmer for about 5 minutes until the mixture feels well combined. Add the quinoa and simmer until the quinoa is cooked, about 20 minutes. Add chopped herbs to the soup and let it sit for a few minutes before serving with additional herb garnish.